Odaiba Tokyo Ooedo-Onsen Monogatari is a hot spring ‘theme park’ popular with both local and foreign tourists that recreates the look and life of Edo. Projecting mapping by NAKED was brought to the entrance of the establishment on March 22, 2018. The projection mapping display flies out across the hot spring water from the buildings. The footbath area themed on the 53 Stations of the Tōkaidō from the Edo Period is wrapped in ukiyo-e and patterns found on yukata, a popular dresswear in the building. 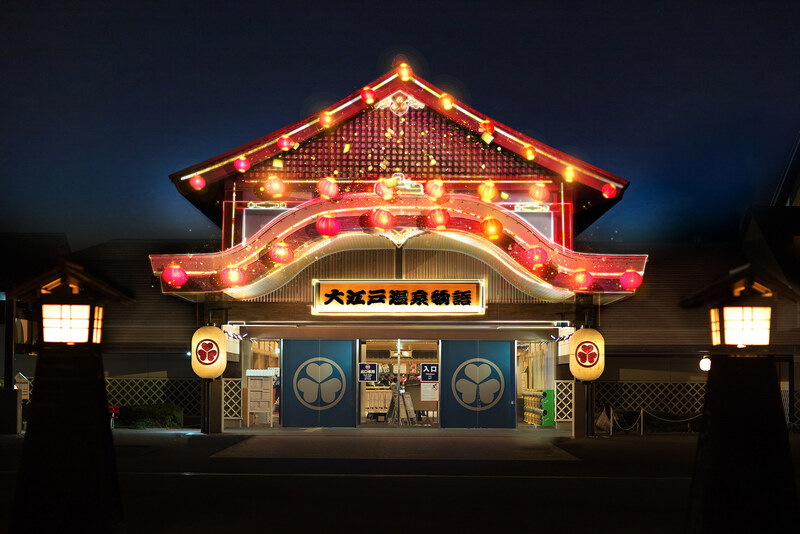 At “Happyaku Yacho” on the main street in the building where the stalls are lined up, paper lanterns and digital lights illuminate to recreate the atmosphere of a festival during Edo. Experience an Edo festival in Odaiba at Ooedo-Onsen Monogatari! Permanent display from March 22, 2018. Time: 30-minutes after sunset until 12:00pm. *Please note that sunset changes depending on the period.